home < blog < The Perfect Mother – HA HA HA HA!!! After thinking about what I might say in a pledge to my community (see the One Community Initiative) it struck me that I do have several grievances (I thought I was pretty laid back…!) but my current top 2 are people who can’t use their indicators (especially at roundabouts…grrrr!) and chickenpox. 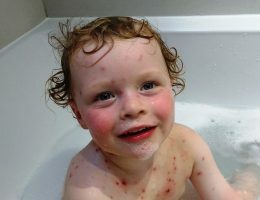 I officially hate chickenpox. I hate that one child gets it and it cruelly and slowly infects everyone around them in a silent toxic chemical warfare and before you even know it they’re infectious and infected. And then after several nights of comforting a child in itchy-agony you have a brief reprieve, enough to forget to watch for symptoms in the siblings. Then the usually placid child is grotty and won’t stop whinging making me think, “I hope he’s coming down with something” and bang! Here we go again. Round 2 and 3 as two more go down but so much worse (how can it get worse?! )…and I thought they’d already had it years ago. My pledge to be more patient and fun with the kids is being stretched to within a hair’s breadth. (I knew it might be too much to try two things at once.) I feel like my head is going to explode; I can literally imagine it flying into a million pieces as I’m screaming inside. I can’t even do the caring mother thing (I do try occasionally and I used to be good at drama at school so it’s fun to act at being that perfect mother sometimes) and gently soothe them with a cuddle because touching them is so painful; for them, not me – although, sometimes it is for me, after a day of whinging and running oat baths not too hot and applying lotions and potions and giving medicines and cleaning the bathroom floor because the toddler missed the toilet whilst I was welcoming home my eldest who is truly indignant because he still has to go to school whilst the others are all home. And, back to the other two whinging for more medicine and comforting as we have to postpone No.2’s birthday party…I seriously hate chickenpox. On a happier note Nos 3 & 4 have enjoyed spending so much time together in the past 10 days (TEN DAYS!! Honestly, if you ever see a woman in town looking SHOCKING she may have just survived her children’s chickenpox imprisonment) that I found them snuggled in the same bed last night fast asleep in each other’s arms. It really was heart-warming; almost enough to make the PIT that the house has become a worry for another day!